UPDATE: My heart hurts to tell you this, but Topsy has been purchased by Apple and no longer exists. Let’s all take a moment of silence…. Now that we’ve mourned properly, feel free to check out the rest of our blog! There’s lots of good stuff that will make you a better marketer. I’ve been using a social media tool called Topsy for quite a while. It’s part of my day-to-day marketing tool belt. 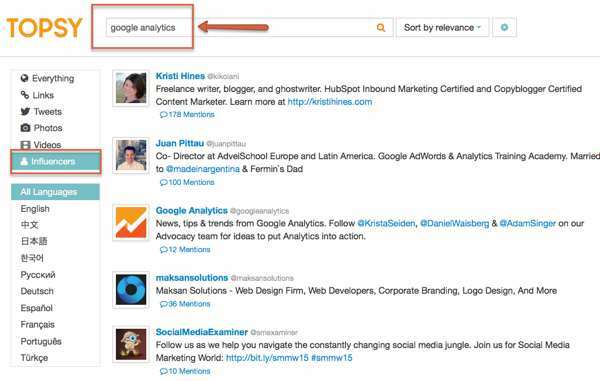 If you’re not familiar, Topsy is a free social search engine / analytics tool. 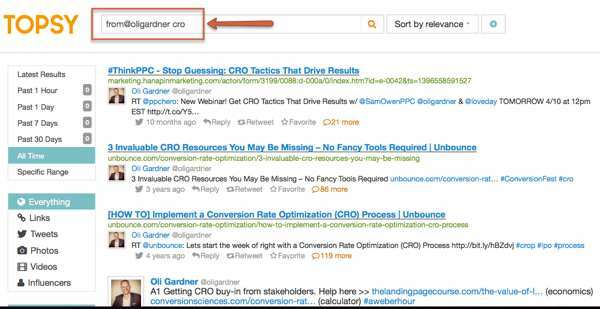 You can search by brand name, topic, hashtag, video, and image, or link directly to a blog post to see how many times it’s been tweeted, etc….It’s basically like Google, but for Twitter and Google+. Last year we did a blogger survey. We did a massive outreach and asked all of our friends, families, coworkers, and strangers on the street to share it. Our hope was to get 1,000 bloggers to fill it out. But as the word spread, how would we know who was sharing the survey unless they mentioned us in their Tweets? We wouldn’t. This is why I absolutely love Topsy. 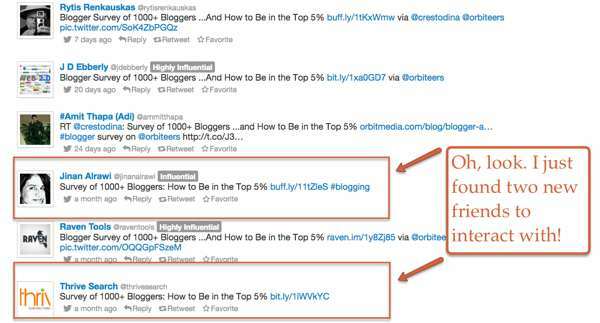 All you need to do is enter in the link of the page into Topsy and it shows you who’s tweeting your content. Brilliant. I can cruise through all of these tweets and reply directly to people, find folks that haven’t tagged us, start conversations, and find a bunch of new fans to follow. After you do your search, the results will be broken up by “All Tweets” and “Influential Only” Tweets. There have been 724 tweets about the blogger survey and of those, 117 are coming from influential Twitter accounts. Fantastic! Here are the first 6 results…. Of these, only two people mentioned us in the tweet. Do you know what that means? I just found four highly influential people that were kind enough to share our content that I wouldn’t have found otherwise. If I were using the basic Twitter search tools, I would not have found these tweets. Now I can start building relationships with them by saying thanks, adding them to a Twitter list, and sharing their content. It’s all about building relationships. If you’re not making friends, you’re doing it wrong. There are several ways to find new friends by using the tool. 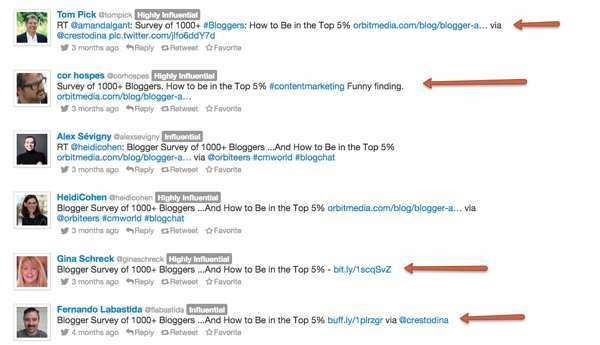 Here’s an example where two people tweeted about the blogger survey. They never mentioned us in the tweet, so without Topsy I would have no way of knowing that they shared our content. By using Topsy, in two seconds, I found them and was able to strike up a conversation. Plug in an influencer, a hashtag, a link; watch the conversation that’s happening. Jump in and start chatting. I recently became a fan of Oli Gardner (I don’t think he knows this yet, but I did). He’s a really smart conversion rate optimizer. I can use Topsy to go search through all of his Tweets if I want to see what he’s been sharing. Just search “from@username” and it will give you results for the past hour, day, week, month, etc..
side note: Sorry, Oli. I had to blur out your cuss word. PG-13 over here on the Orbit blog. Now I can see all the content that he’s Tweeting relating to CRO. If you’re trying to locate influencers, keep an eye on who the leaders in your industry are following. What articles are they sharing? Who do they mention on a semi-regular basis? You should be able to build a list of people to follow and start connecting with them in no time. 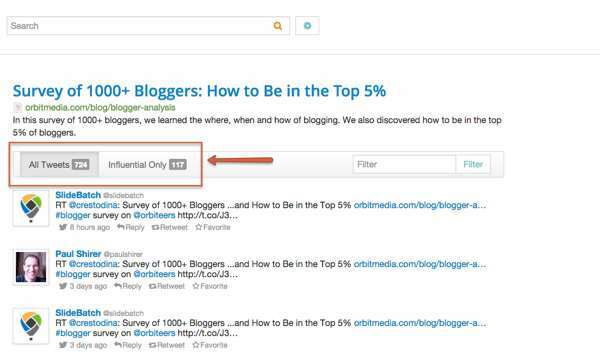 You can also search by keyword and then look at “influencers” in the left column to see who the influencers are for that particular topic and create a list that way. So that’s how I find people, listen to them, and eventually make friends using Topsy. Feel free to share your tips in the comments below! I’m always on the look out for tools that take you behind the scenes. This is an excellent post. 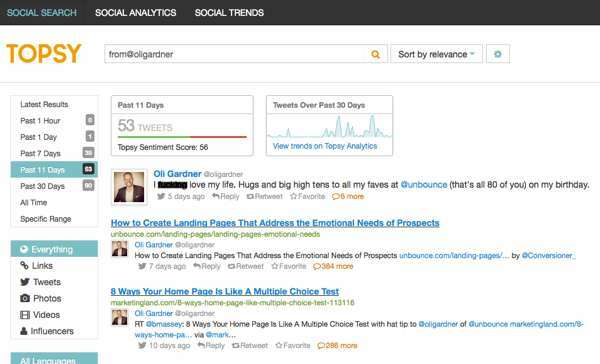 I especially like the idea of using Topsy to build relationships and to catch up on things you may have missed. Great work! Thanks for this! Only joined Twitter a couple of weeks ago, so am soaking up all tips and advice on how to best use it as a networking tool. Excellent! Glad you liked it, Geraldine. Isn’t that pic great? Makes me want to grab my friends and bust out Twister! 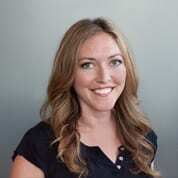 Great article on Topsy. I’m going to try it out today. I’m always looking for new tools to make social media management and engagement a bit easier. Thanks! You bet, Sue! It’s easy to get sucked in so be careful. 😉 Let me know if you find any new tricks! My pleasure, Michele. Thank you for stopping by and leaving a comment! Thanks for the reminder about Topsy. I haven’t used it in ages, but i will check it out again. No problem! Let me know how it goes and if you want to share some new tricks, I’m all ears. Thanks, Breanna.